When it comes to choosing a dentist, the best people to talk to are the ones who have been in our chairs! 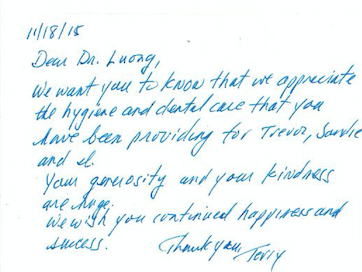 See what our happy patients have to say about Dr. Luong on Yelp!, Facebook and Google+ and please leave your own review too! Season's greetings and warm wishes to each of your lovely, thoughtful, and gracious people! Thank you for another year of care. 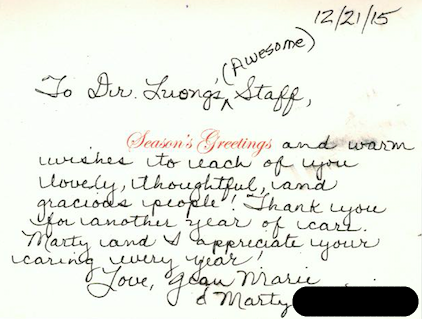 Marty and I appreciate your caring every year. "Appreciate your patience....removing my wisdom tooth!" Just a note to say how much I appreciate your patience and also for being so kind to me when you removed my wisdom tooth! So happy to have it out and over with. Have a wonderful holiday season and again much thanks! 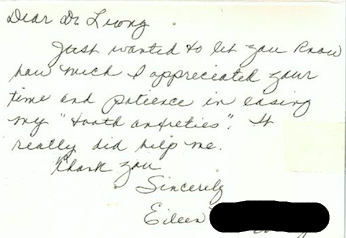 Just wanted to let you know how much I appreciate your time and patience "tooth anxieties." It really did help me. Thank you. Thank you for the cheerful comfort you supplied on my first visit to your office. In the past, I have had some pretty anxious moments in dental offices, especially during my early years growing up. In addition, I had to leave my former dentist after about 35 years (est. ), upon his recent retirement. I was pleasantly surprised to find my visit such an inviting and enjoyable experience. You, and your office staff, are most welcoming. This reflects a low stress environment and has a calming effect. I just wanted to let you know. Thank you for your excellent care. It was comforting to know that my teeth and gums were doing well and that I am now in "a maintenance phase" of dental care. I will try to keep up my end with flossing, which I have not done very consistently. Jessica said that my gums looked quite pink and that I must be doing a good job with the flossing. That was music to my ears! Best wishes to you and your staff each and every day. 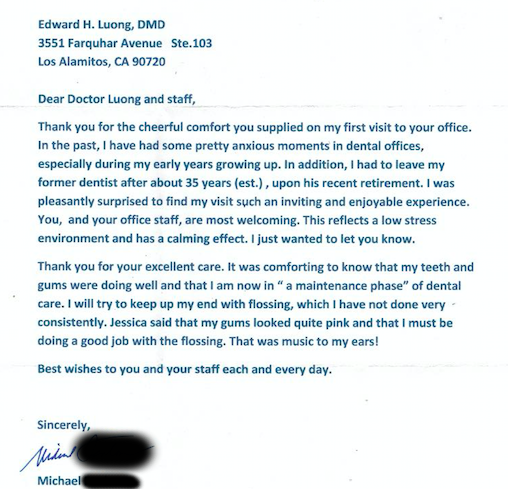 We Feel Very Lucky to Have You for our Dentist! 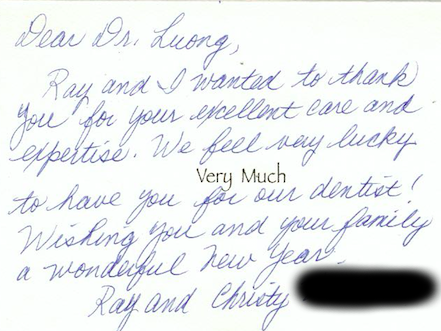 Ray and I wanted to thank you for the excellent care and expertise. 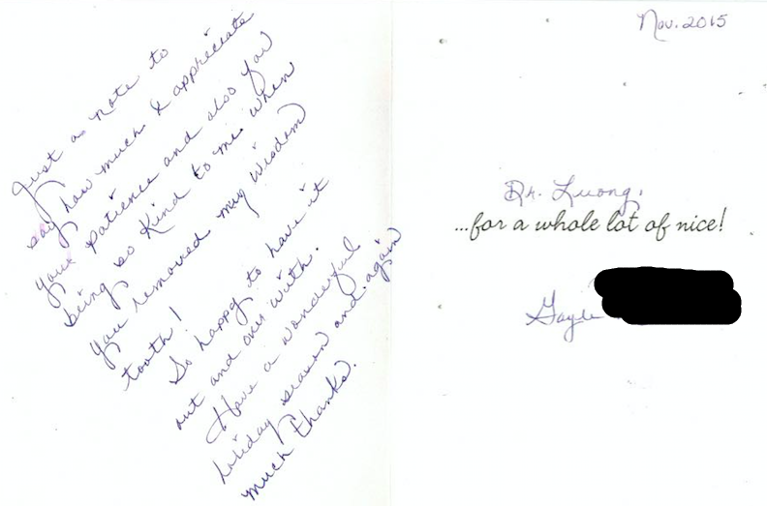 We feel very lucky to have you for our dentist! Wishing you and your family a wonderful New Year. We want you to know that we appreciate the hygiene and dental care that you have been providing for Trevor, Sandie and I. Your generosity and your kindness are huge. We wish you continued happiness and success. Thank you.